Addicts’ Anecdotes is a community book filled with frank and personal stories of alcohol and drug addiction, and the positive journeys of recovery each writer is on. The book is structured in two sides, like a record, with personal stories showing some of the reasons why the writers took drugs or alcohol, and then a “flip-side” with the darker sides to addiction, but also showing how they as people are now on a journey of recovery. 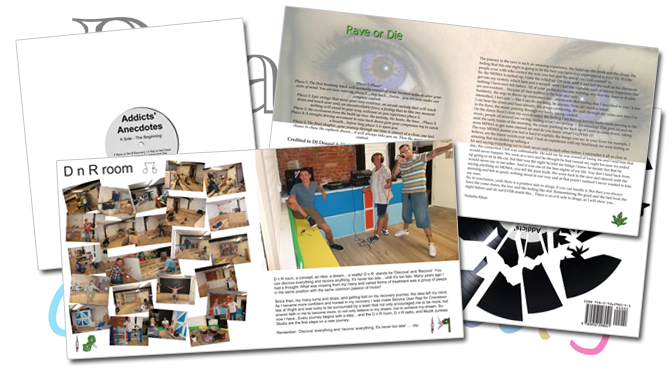 This community book was created by a group from Cranstoun Isle of Wight’s DnR Room, a music-based recovery charity, created and run by people who have recovered (and are recovering) from drug and alcohol problems. This is the first book to be published by Beachy Community Books – a not-for-profit community imprint of Beachy Books. The group of adults from DnR Room worked with author and publisher, Philip Bell of Beachy Books, over 12 weeks where he helped them learn the skills needed to create their own book filled with personal experiences. The Beachy Books community book projects were funded by the Arts Council and Isle of Wight Adult Community Learning. After costs, all profit from the sale of this book go back to the DnR Room. Age: Teenagers, young adults and above, as some content and subject matter of the book is not suitable for young children. Beachy Books are NEVER out of stock! Often online retailers will carry physical stock, but Beachy Books and Beachy Community Books are NEVER really out of stock, as they are Print On Demand (POD), so even if it says “out of stock”, you WILL get a book when you order, because a book will be printed and sent to you via the on-line seller. If they don’t have physical stock, it’ll just take a bit longer to get your book, but they are worth the wait! If you have any problems contact us!